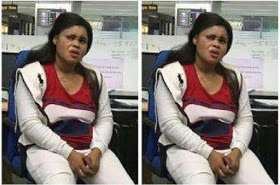 A Nigerian woman, who has been identified as David Blessing, has been arrested in India. According to News18 reports, The woman who concealed LSD blots and cocaine in her private parts, was arrested by the Kolkata unit of the Narcotics Control Bureau (NCB) on Monday evening. David Blessing, a 30-year-old lady, was intercepted the moment she landed in Kolkata from Mumbai at Netaji Subhash Chandra Bose International Airport at around 9.20 PM. Of late, Kolkata seems to have become a major hub/corridor for banned drugs with over 60 arrests made this year itself. A large quantity of banned drugs has also been seized and destroyed. Recently, five Chinese national were arrested from Kolkata station for carrying 200 kilos of ‘Amphetamine’, popularly known as the ‘dead drug’, worth Rs 40 crore. This was for the first time when Chinese nationals were arrested in Kolkata with such a large quantity banned drugs. On April 17, son of a well-known restaurateur and celebrity chef, along with a son of a Kolkata-based industrialist, was arrested in connection with international drug racket by the Kolkata NCB. A large quantity of psychotropic substances, including Ecstacy, LSD blots and Psilocybin mushroom also known as ‘magic mushrooms’, were seized from their possession. That was the first time that ‘magic mushrooms’, usually available in Mexico, South America, Malaysia, Indonesia and Australia, were seized from Kolkata. “Our major concern is that the youths and school students are fast getting addicted to these substances in the city and we have to stop this,” Srivastava said.